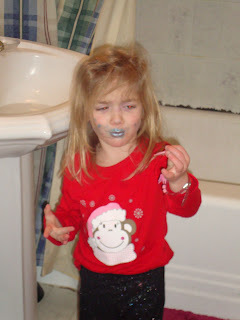 Adelyn got into the make up........AGAIN! This is what greeted us in the bathroom a couple of days ago. Adelyn got into her make up again and by the looks of her face, had second thoughts about it all. Two things should be noted here: One, this was about two hours after we had put her to bed. Two, the make up was Brittany's idea for a gift. This is Jon. 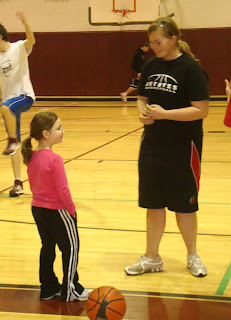 Delaney signed up for a Saturday basketball camp through next month and yesterday was day one. She was pretty hesitant once we got there. There were about 45 kids, give or take a few, and most of them had some sort of basketball skill, with a few of them pretty solid players for their age. She struggled with dribbling and shooting, but by the end of the 90-minute session, she was much more comfortable with it all, thanks in large part to her new friend and coach Megan. Here they are, just chatting after a drill. Practicing lay ups. I think Delaney's right leg in the air is pretty cute. This is Delaney practicing her form for lay ups. I think she thinks they're doing some sort of dance. This is Jon. We also got to spend Christmas Eve with Grandma Debbie in Cle Elum. 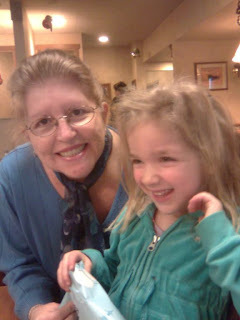 The girls met me in my office in Cle Elum, we closed the bank early and had dinner with my mom. Of course, before we did that, Adelyn was helping me in the bank branch and while we were screwing around behind the teller line, she pushed one of our silent alarms and didn't find out until a nanosecond later when Wells Fargo security called. Grandma Debbie with her cute grandkids. Below is me and girls chillin' on New Year's Eve. Our original plans was to ring in the new year with our cousins in Tacoma and then spend the day on January 1st at the Guddat Family Christmas. Unfortunately, due to sickness and schedules, none of that happened. We still got to have fun though and we popped out the sparkling cider for the girls to sip on. Christmas with the Guddat Family! This is Jon. 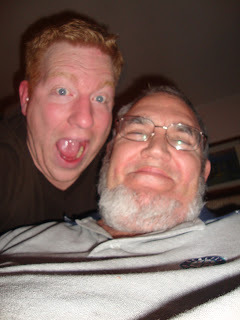 We headed over to Dad and Sharon's house to spend Christmas with my side of the family. 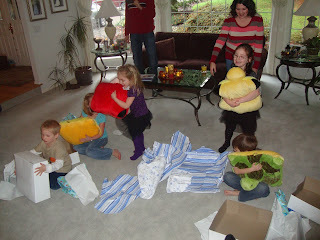 Jerrod, Megan and kids were there as well as Jim and Sanda and Great Grandma Guddat. Let's get right to it: Jim said his presents were going to make him and Sanda "favorites". Since everyone got pillow pets, that statement can't really be debated. Grandma Sharon and Jocelyn spent time reading a book with everyone. Grandpa Jeff writing down the house rules. With five cousins, plus newborn Jacob (and Preston to be here soon) we all needed to ensure the house didn't get torn apart. Back to the gifts: In classic Dad and Sharon form, the cousins' gifts were unique and personalized. Each of them got a book with their names the basis of the story. Really cool. Adelyn had big hugs for her big cousin Jocelyn. Jayden was no match for the girls' hugs, as well. I'm posting this because Jayden looks EXACTLY like Jerrod did at five years old. Me and my home boy, Jacob. This is Jon. As with tradition, the Liedtkes came over on the night of Christmas to do a little celebrating at our humble abode. Jon and Duane. Yes, it gets this crazy with us in the same room. Delaney unwrapping her new scooter. Ever since Addy Bear got hers for her birthday, Delaney has wanted one. Adelyn's High School Musical yearbook. I'll admit to reading it as well. Adelyn was content to sit in the middle of the floor to read her new books. But she and Delaney got energized for a little craziness with Uncle Zach. Delaney is clearly thrilled with the new BBQ grill since Daddy nearly blew up the house with the old one. This is Jon. It's been a while since I've posted and since it's January 2nd, I figured it's time to put up our Christmas photos. 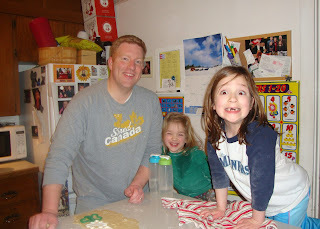 Making cookies the night before Christmas. Adelyn had soaked herself because apparently, she forgot how to drink out of a cup. Delaney is high on sugar-based frosting. My girls, just chillin' with some of their new gifts and playing the Scooby Doo version of the game Trouble.